Robservations – the Blog of Robert Booth » Where’s my brain ? A recent article containing some strong visuals, caught my attention whilst surfing online. For anyone that doesn’t know him (but I think most of you will) he is the guy below that you have to find in busy pictures in children’s books. How mistaken I was and while I admire hugely the intentions and efforts of Mr Mosley, I found it a little sad that his stupendous, skin sketch only raised $2k for charity. Grandson: What is it about? 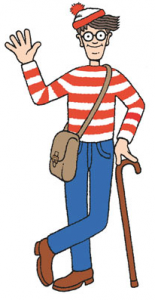 Grandad: There used to be a series of books called ‘Where’s Wally’ where you had to find a boy wearing a red and white striped shirt, hat and glasses’ in a big, busy crowd of people. It is a scene from that. 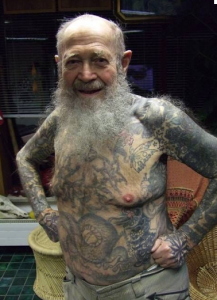 Grandad: Err….errr…errr…errrrr…do you fancy a swim? I think they’re going to find the Wally faster than he thinks.